Tennis Elbow is also known as lateral epicondylitis, lateral elbow tendinopathy or extensor tendinopathy. It is a common term used to describe chronic pain on the outside of the elbow. Despite its name, playing Tennis is less likely to be a cause of injury than repetitive strain from work-related activities. The main symptom is a pain about 1 to 2 cm down from the bony part on the outside of the elbow, known as the lateral epicondyle. There may be a weakness in the muscles around the forearm and wrist resulting in difficulty in performing simple tasks such as gripping objects, opening a door handle or shaking hands with someone. Pain may occur suddenly but often it develops gradually over time with the athlete putting up with a niggle, or discomfort for a period of time. An acute injury will become chronic if not treated correctly and a chronic injury can flare up as an acute injury. After taking a full history from the patient of how and when the pain started, a doctor or professional therapist may perform a number of specific assessment tests to help diagnose lateral elbow pain. This strength of the wrist extensor muscles can be assessed, and whether pain is reproduced by getting the patient to move the wrist into extension whilst the therapist resists the movement. More specifically, they may choose to do a perform the test where the patient attempts to straighten just the middle finger, as this is often the most sensitive tennis elbow test. Other tests such as the ‘Mills maneuver’ and the ‘neural tension’ test may be performed to check for nerve involvement as other injuries such as the entrapment of the radial nerve, and certain neck injuries may have similar symptoms. Finally, the therapist may choose to feel (palpate) around the outside of the elbow to see if there are any tender spots particularly at the point the wrist extensor muscles attach to the lateral epicondyle. The wrist extensor muscles consist attach to the bony bit on the outside of the elbow called the lateral epicondyle of the humerus bone. Overuse or repetitive strain can cause the tendon to become inflamed and over time the tendon degenerates. Most commonly Tennis elbow pain occurs at the junction where the tendon of the ‘extensor carpi radialis brevis’ muscle inserts into the bone. At this point, there are a large number of pain receptors making this region particularly tender to touch. Pain can be acute or chronic. Chronic injuries on the other hand normally develop over a period of days/weeks and usually follows bouts of intense exercise/activity that the patient is unaccustomed to, such as lifting heavy boxes when moving house. The medical term often used is lateral epicondylitis but this can be misleading as the ‘itis’ on the end of the word implies that there is inflammation. In long term cases, the acute inflammatory stage has passed and tendinopathy is an appropriate term as this describes degeneration of the tendon rather than acute inflammation. The most common cause of Tennis elbow is overuse or repetitive strain of the muscles caused by a repeated extension or bending back of the wrist. Gripping or turning objects like a manual screwdriver, lifting heavy weights during strength training or repeatedly performing occupational activities such as lifting bricks are all common causes of tennis elbow. The injury got its name because playing a backhand in Tennis with a bent wrist is a surefire way to cause injury. The huge force of the ball striking the racket is transferred through the forearm to the point on the outside of the elbow. This is made worse if the wrist is bent when striking the ball as the forces are transmitted through the muscle and tendon rather than the whole arm. It is not an injury that affects regular Tennis players as they are likely to have good technique. Other possible factors related specifically to tennis are gripping the racquet too tightly, having the strings of the racquet too tight, or the grip too small, which will force the forearm muscle to overwork. Treatment involves reducing symptoms of pain and inflammation then exercises to gradually increase the load through the elbow to a point where normal training and competition can be resumed. In the first 72 hours post injury, apply the principles of P.R.I.C.E. (Protection, Rest, Ice, Compression, and Elevation). Rest – Rest is probably the most important part of treatment and is often difficult to do. If you continue to use the painful elbow then it will not recover as quickly and may become chronic and very difficult to treat. Avoid gripping heavy things, opening heavy doors, using a screwdriver and of course playing a backhand in tennis. Ice – Apply a cold compression wrap for no more than 15 minutes as the injured tissues are very close to the skin and do not need longer. Protection – Wearing a specialist elbow brace or support can help reduce the strain on the tendon enabling healing to take place. This works by applying compression around the upper arm which puts pressure on the injured tendon, changing the way forces are transmitted, allowing the injured tissues to rest. Massage – can be a useful treatment for tennis elbow, particularly more chronic conditions. In particular cross friction massage of the tendon insertion but only once the initial inflammation has settled (after 5 days) is done. Place the 2nd finger of your opposite hand on the outside of the elbow and rub across the tendon (painful area) for 5 minutes. Do not press too hard but there may be some mild pain whilst having the area ‘frictioned‘. Repeat once a day. Do not carry on with this exercise if the pain worsens after the treatment. Every Tennis Elbow injury will react differently to the different treatments available so using a number of them concurrently is often the most effective way of treating the condition. In addition to treating the current injury, it is also important to identify and correct any possible causes that may be either work-related or sport related and your therapist will be able to advise how to achieve this. Medication – A professional therapist or doctor may prescribe medication such as Ibuprofen to help reduce symptoms in the early stages, however, the effectiveness of this long-term is disputed. Do not take Ibuprofen if you have Asthma. Ultrasound – this involves passing high-frequency sound waves into the tissues. This vibrates the molecules and depending on if it is applied continuously or in pulses can generate heat. Laser – works by passing high-intensity light into the tendon to reduce pain, inflammation and encourage cell reproduction. No heat is generated with laser treatment. Acupuncture – Dry needling or Acupuncture has been shown to be an effective treatment for tennis elbow (in some cases). It involves inserting needles of various lengths and diameters into specific points around the forearm and surrounding areas. The needle is usually inserted, rotated and then left in place for several minutes and the theory of how it works is to hopefully alter the way pain signals are transmitted via the nerve pathways. Corticosteroid injections – Another treatment for Tennis elbow is injecting corticosteroid drugs into the area. Current evidence has shown them to be effective in the short term but the long term effects are debatable. In order to improve the chances of a good end result, the patient often requires a series of injections over a period of weeks or months as opposed to a one-off injection. 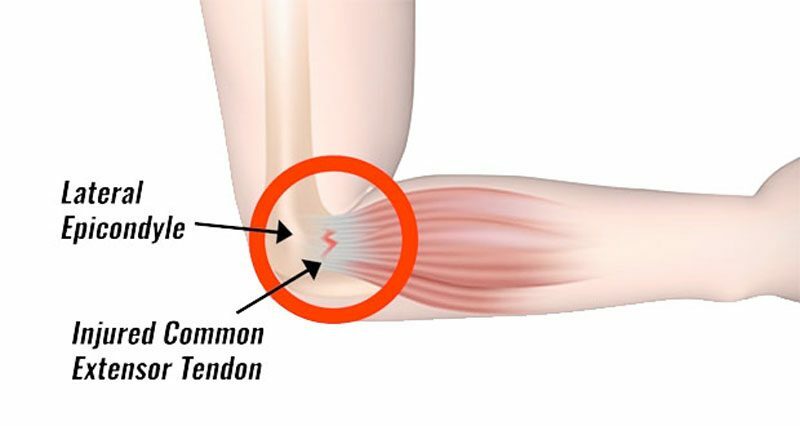 The steroid should be injected around the area of the tendon attachment and not into the body of the tendon as there have been cases of tendon ruptures following steroid injections. Nitric oxide donor therapy patches – applied to the elbow may be beneficial over a period of months although approximately 5% of patients will have side effects including headaches and skin rashes. Botox injections – thought to improve short term pain relief although there is a very high likelihood that the forearm muscles will not function properly afterward. Autologous blood injection – involves centrifuging the patient’s own blood to separate the plasma from the red blood cells. The resulting plasma is rich in platelets that are effective for healing. This is then injected back in and around the site of injury. It is thought to re-initiate or enhance the inflammation repair response. Both stretching and strengthening exercises are important for treating Tennis Elbow and provide the foundation for a rehabilitation program. Stretching exercises should be performed as soon as pain allows and then continued until and after full fitness has been achieved. Strengthening exercises should only be performed pain-free. It is better to wait a bit longer to introduce strength exercises than to begin them too soon and make the injury worse. If any adverse effects or pain is felt either during, after or the next day then rest some more and take a step back. Stretching – The most important stretching exercise is to stretch the wrist extensor muscles. The arm is placed in front with the hand pointing down. Pull the hand towards the body to feel a stretch in the back of the wrist, forearm, and elbow. The forearm can be rotated inwards to increase the stretch which will be felt more on the outside of the elbow. The stretch can be held for 20 seconds and repeated up to 5 times. Strengthening – Strengthening exercises should begin with isometric or static exercises which do not involve movement of the wrist. These progress onto dynamic wrist extension and finger extension exercises which involve movement against resistance from a weight or elastic resistance band. Eventually, more functional or sports specific type exercises will be done if the injury is sport related. Read more on tennis elbow exercises. Both golfers elbow and tennis elbow are approached in a similar manner which it comes to surgery. The vast majority of cases of tennis elbow do respond to conservative treatment of rest, ice, ultrasound and occasionally a steroid injection, however, if however if surgery is required then it may be 8 weeks before the patient has recovered. Surgical treatment of tennis elbow consists of recessing and releasing the portion of the frayed or diseased tendon, removing it from the bone whether it be on the inside for golfer’s elbow or the outside for tennis elbow. More modern techniques undertake the same operation using endoscopic or keyhole surgery where a very small incision is made rather than opening up the area. The principle of tennis elbow surgery is the same whatever the surgical technique and that is to release the damaged tendon from the bone. Also, these days patients can be treated with platelet-rich plasma injections where blood is taken from the patient themselves and with a centrifuge the clotting and healing factors of the patient’s blood are injected into the area on the elbow where the tendon has frayed.